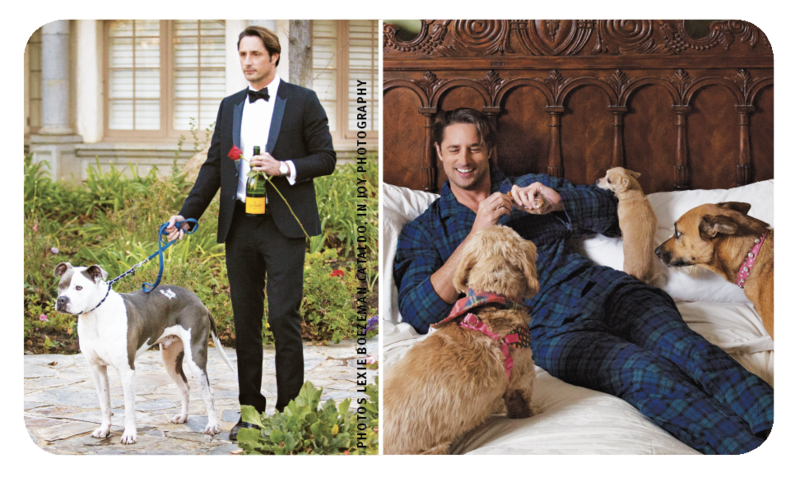 An Eligible, Dog-loving Prince—YES PLEASE! It seems almost too good to be true. In a real-life fairy tale waiting to happen, we have a prince—yes, a real actual prince—with good looks, charm, fortune, and pedigree, looking for his princess. The scion of an Italian noble family, Prince Lorenzo Borghese can trace his lineage back past the 13th century, but don’t think that makes him stuffy. Our prince loves animals and is devoted to their rescue, rolling up his sleeves and getting down with rescue-dog transport as co-founder of Animal Aid USA. As for his would-be partner, well, it’s a prerequisite that she love dogs too. If any of this sounds familiar, it’s likely because Lorenzo was the star of the ninth season of ABC’s The Bachelor, though, lucky for us, the season failed to end in pending nuptials. When we saw a recent pro-rescue spoof of The Bachelor in which Lorenzo holds a rose ceremony for an assembled crew of adoptable dogs, we decided it was high time we chatted with the prince about his incredible commitment to and passion for rescuing dogs and, yes, ask a few questions about just who might get the final rose in his continued search for Miss Right. Lorenzo got involved with dog rescue when he launched his natural pet spa and wellness line, the Royal Treatment, in 2002. (Paraben and surfactant-free, he was way ahead of the curve. Lorenzo’s family has been in cosmetics since the 1950s.) “I started doing research and was shocked with how we treat our animals, how we euthanize, how there are animals you could adopt instead of buy, what’s going on with puppy mills,” Lorenzo explains. Inspired to help, he started volunteering and, at a fundraising event, was put in touch with Karen Talbot LaSasso. Karen had founded a dog rescue initiative for her son’s elementary school, which had grown into The MOMS Rescue and Georgia Puppy Caravan. Lorenzo was so impressed with Karen’s animal rescue work focused on rescuing dogs from kill-shelters in Georgia—“one of the most inhumane states with regard to the treatment of animals,” Lorenzo notes—that he knew he had to go along on one of her rescue missions. He was so moved by the experience that he wanted to help Karen take it to the next level. Together they co-founded Animal Aid USA, a non-profit dedicated to rescuing and re-homing Southern shelter dogs. Today, hundreds of volunteers participate in a monthly rescue transport of Georgian rescue dogs to their new lives in South Jersey and beyond. To date, they have saved over 11,000 dogs. There are lots of volunteers involved in these feel-good missions, both in the actual transport itself and in the reception of the dogs upon their arrival. “At the South Jersey receiving area there are a ton of volunteers, like the Girl Scouts, that wait for us,” Lorenzo shares. “They bathe the dogs, get them ready for adoption.” Knowing firsthand the power of a good PR campaign, Lorenzo frequently arranges for some of the dogs to be featured on TV in “surprise adoptions.” Lorenzo recounts one such segment featuring a young woman who was fostering a Yorkie she had become quite attached to. When Lorenzo announces that the dog has been adopted, the young woman is visibly upset—until, in a perfect TV moment, it’s revealed that the adopter is actually her mom. There are happy tears all around. Foster Kindness — Foster a Dog!